Executive Chef/Partner Greg Richie is well known as the man who fronted Orlando restaurants for celebrity chefs Emeril Lagasse and Roy Yamaguchi. With Soco, he returns to his Southern roots with a contemporary interpretation of one of America’s classic cuisines. Richie graduated with honors from the acclaimed Johnson and Wales University in Charleston. The award-winning chef spent his early professional years in the kitchens of renowned Southern restaurants that included Carolina’s and Magnolias in Charleston; The Abbey, Atlanta; The Lark and the Dove, Roswell, Georgia; and the Atlanta Athletic Club. Chef Greg worked with James Beard Award Winner Roy Yamaguchi at the original Roy’s Restaurant in Hawaii and was selected to be the first Executive Chef/Partner for Roy’s in Orlando. He was then chosen by Lagasse to take over his kitchens of Tchoup Chop at the Royal Pacific Resort at Universal Orlando. Richie has cooked multiple times at the prestigious James Beard House in Manhattan, a sought-after honor among chefs, and he is a charter member of SunshinePlate, a coalition of chefs and culinary industry professionals dedicated to food advocacy. Chef Richie is also a member of the Southern Foodways Alliance, and sits on the Board of Directors for the District of Thornton Park. Chef Greg’s awards include Chef of the Year and Best Local Chef. His restaurants have won many awards, such as Soco’s Best New Restaurant and Orlando’s Best Brunch. Baoery Restaurant also won Best Happy Hour and Most Pet Friendly and in previous Executive Chef/Partner positions he won Best Signature Dish and Best Seafood in Orlando. He was perennially named to Restaurant Forum’s list of the Top 20 Chefs in Central Florida and has made numerous appearances on local and national television shows. In addition to being a highly awarded chef, Mr. Richie competed in and won 1 st place in the national cocktail making competition “Meeting of the Masters” held in Las Vegas between some of the top bartenders in America. 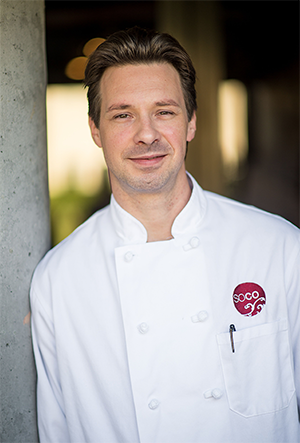 Chef Greg developed the Soco menu and restaurant concept over the several years leading up to it’s opening. Soco is his expression of an exciting new dining experience and he is very pleased to introduce you to Southern Contemporary Cuisine!